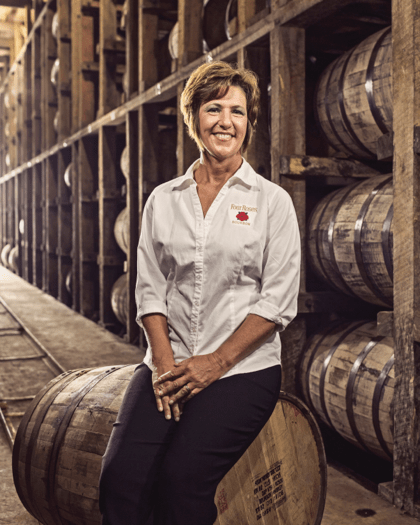 We sat down with Corey Ballard, our director of warehouse and bottling, to talk Bourbon, basketball, and what she likes most about her job. Read on for this behind-the-scenes Employee Spotlight. How long have your worked at Four Roses? I started in February of 1999, so almost 17 years! Describe a typical day for you at Four Roses: For me there is no “typical day.” I wear many hats and I never know in which direction the day may go. I generally have a plan for the day, but it’s rare for that plan to work out as scheduled. That’s one of the things I like the most about my job, that every day is a little different than the one before. Unfortunately, tasting is not part of my typical day; instead I track barrel inventory and bottling operations, to make sure you all get the bourbon you desire. What is the best part of your job? For me, the best thing about working at Four Roses is that all opinions matter, each person’s strengths are recognized and utilized and the growth potential for each of us is in our own hands. I feel blessed to work here. This really is the best company and work environment I have experienced. If I can still say that after 16 years it must be true. What’s your favorite Four Roses product? Four Roses Small Batch is my favorite. I love the spicy characteristics. What’s your favorite cocktail? Pour me a whiskey sour made with Four Roses Small Batch, please. Are you a sports fan? I am a big University of Louisville fan. I love both football and basketball. Go CARDS!